Jasmine was featured in 2013 and her story is worth re-telling. Jasmen is the third of nine children and her journey with the Banilad Centre for Professional Develpment (BCPD) began when a former student went shopping and met Jasmen and her mother at a market stall in the Carbon Market where they were selling vegetables. The produce that Jasmen and her mother were selling was from their small farm in Dalaguete (south of Cebu), where her father tilled the soil. Jasmen was told about BCPD and, as a result, started studying hospitality and tourism there. Due to their poverty situation, Jasmen’s parents were unable to provide her with money for accommodation, so she slept under a table at the market stall where they sold their farm produce as she had nowhere else to stay. When BCPD heard of her situation they provided her with accommodation. As part of her studies, Jasmen was required to complete on-the-job training which she did at Shangri-la Mactan Resort & Spa. Jasmen showed admirable performance and hardwork during her training days and as a result was offered a job at the five star hotel by one of the managers. 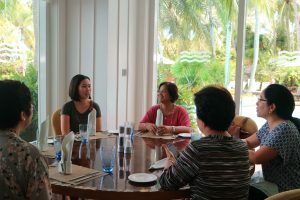 The news brought great joy to Jasmen because the Shangri-la Mactan Resort & Spa is a prestigious hotel in Cebu. She was also overjoyed that the job would enable her to financially help her family. Jasmen was able to achieve the following through her earnings: she was able to help in the renovation of her parents’ house, built a variety store for her mother and bought a motorcycle for her father to have easy transportation from the farm to the city market to sell his produce. Reledev again met Jasmen in 2017 and she was assisting one of her brother’s to complete his electrical engineering degree. In March 2018 she was able to complete her dream and was transferred to the Shangri-la in Dubai where she currently continues to excel through hard work and determination. Jasmen is an example of a woman who took simple but brave steps. From a small farm in Dalaguete, to the stall at the Carbon Market, to the rooms in BCPD. Now Jasmen is a well respected, successful women who challenges herself to make the working environment around her better for others. We need your support; still so many others can benefit from Reledev’s projects, like Jasmen has. You can help by clicking here and donating to the Reledev cause. A little goes a long, long way.